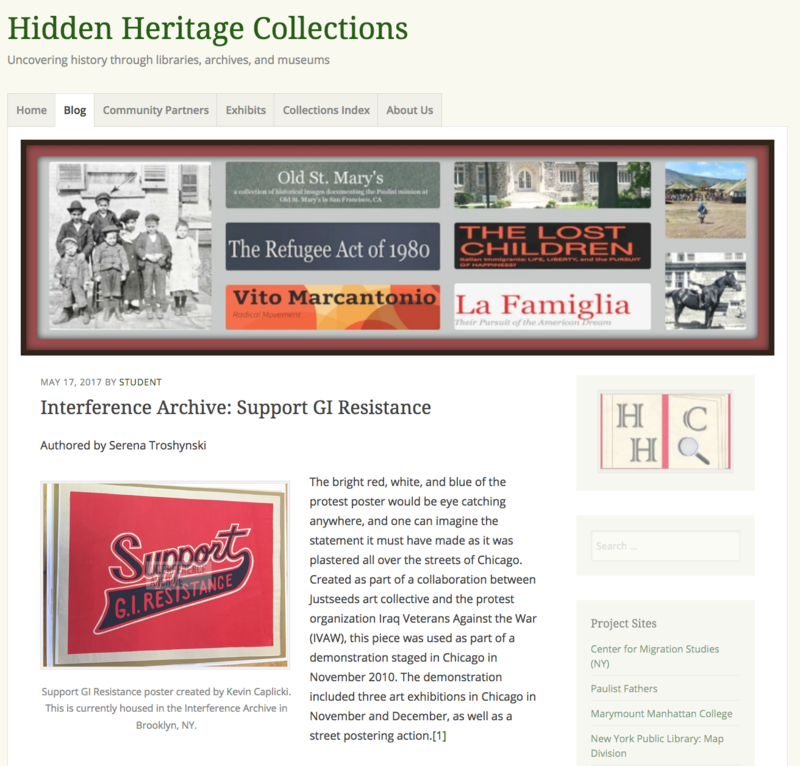 Serena Troshynski, a Library and Information Science student at St. John’s University, selected my Support GI Resistance poster for an assignment that was published on the Hidden Heritage Collections blog. The bright red, white, and blue of the protest poster would be eye catching anywhere, and one can imagine the statement it must have made as it was plastered all over the streets of Chicago. 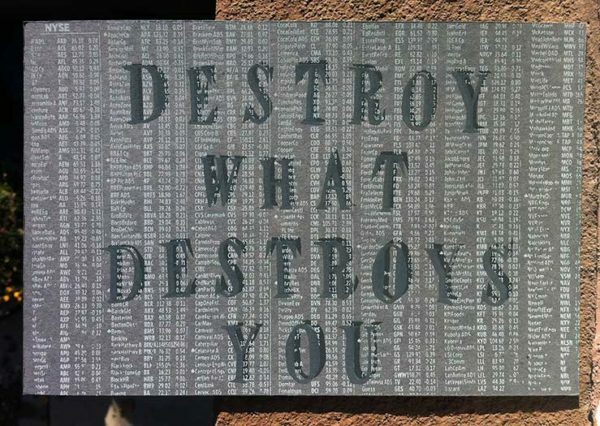 Created as part of a collaboration between Justseeds art collective and the protest organization Iraq Veterans Against the War (IVAW), this piece was used as part of a demonstration staged in Chicago in November 2010. 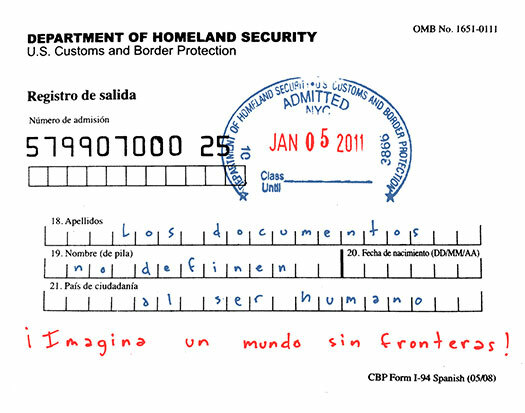 The demonstration included three art exhibitions in Chicago in November and December, as well as a street postering action. Created by artist Kevin Caplicki, the design intended to evoke “very American sports teams, pennants, baseball jerseys, etc.” The allusion to American sports culture is meant to comment on the appeals to patriotism routinely invoked to support wars. The demonstration, “Operation Exposure — Trauma is War” was a protest against the redeployment of veterans with Post Traumatic Stress Disorder, Traumatic Brain Injury, military sexual trauma, or other injuries. The art prints explore the impact of war on civilians and soldiers, and intend to increase awareness of GI resistance and GI rights. The protest also hoped to reshape the narrative of the Iraq War by giving a voice to veterans who experienced serious trauma and injury. This action reclaims marginalized or misrepresented voices in the historical moment, subverting war culture and reclaiming the humanity of the soldiers involved. 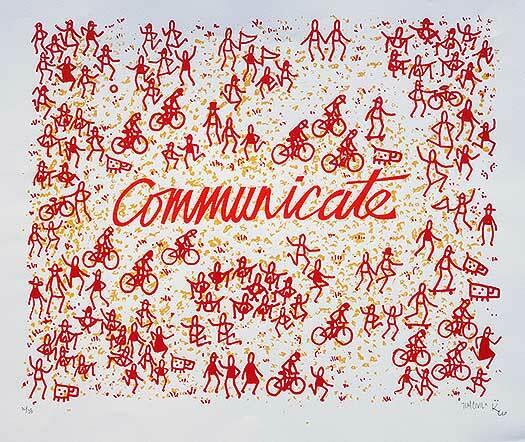 The design itself began as a pencil drawing, and the artist created layers to create a screen-printed version using Rubylith, similar to a hand-cut stencil. The original edition was then hand-screened for Operation Exposure. After the demonstration, the design was made into posters of various sizes, stickers, and embroidered patches. A reproduction of the print, “Support G.I. 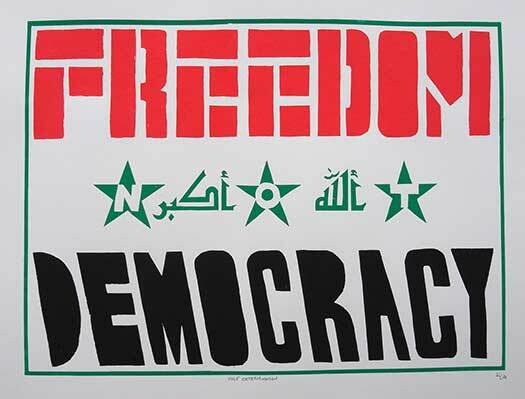 Resistance,” is now part of the Interference Archive’s collection of art prints and posters used in social movements. The print is representative of the Archive’s mission, dedicated to “preserving and honoring histories and material culture that is often marginalized in mainstream institutions.”The artist, Kevin Caplicki, is also a co-founder of the Archive. Thanks to Serena for your interaction with Interference Archive and my poster! Versions of this Support GI Resistance poster are available in the War Is Trauma portfolio. Anarchist Squatters in England find 6Million Pound digs! 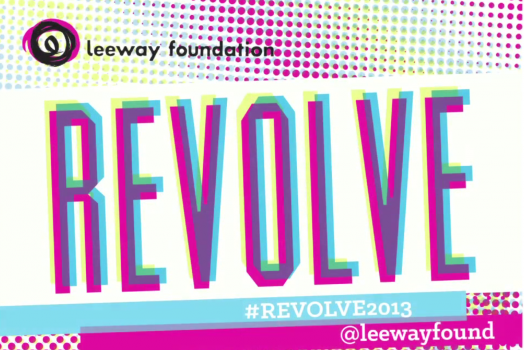 REVOLVE Keynote Presentation: Favianna Rodriguez from PhillyCAM.